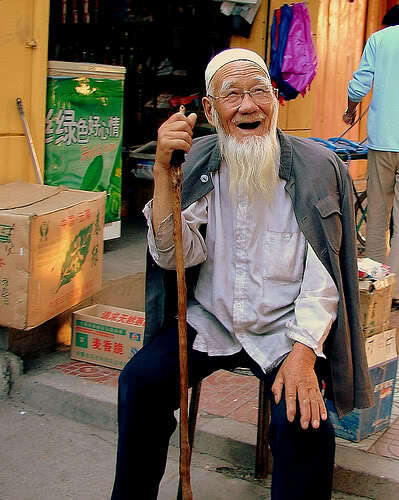 According to figures from the Chinese census on the order of 2% of the population of the People’s Republic of China is likely to be Muslim in their religious identity. 2% may seem like a trivial fraction, but that number is between 20 and 30 million people. In other words if the Muslims of China were their own nation they would be as populous as Iraq. And though Muslims are a very small minority of the Chinese population, approximately 1/4 of the area of China is likely dominated by those adhering to Islam. This is due to the fact that the Turkic majority province of Xinjiang is so expansive in relation to the rest of the China. But the Muslims of China are not an undifferentiated mass; rather they can be divided into two broad classes, those who are part of the Turkic cultural world, mostly Uighur, and those of the Chinese world, the Hui. Though the Uighur are fascinating in their own right, it is the Hui that I wish to focus on. Xinjiang, the “New Territories,” were conquered by the Manchus two centuries ago, and administered as a personal domain of the dynasty which was distinct from China for much of that period. An analogy to a colonized people is very appropriate for the Uighur, for though they have long resided on the margins of the world of China, they have not been of that world. The Hui in contrast are of China, as they speak the dialect of whatever region of China in which they reside, and in general resemble the Han Chinese majority physically. In fact Hui auxiliaries played a role in pacifying Xinjiang and serving as intermediaries between the central government and the local Turkic Muslim population. In China the Hui were distinctive because of their Islamic religion, but in Central Asia they were, and are, notable for their Chinese culture (they are called Dungans in the former Soviet Republics of Central Asia). Though China is notable for its relative isolation from the other civilizations of the world until recently, the presence of Muslims likely dates to only few decades at the latest after the rise of Islam itself. During the Tang dynasty, which peaked in the 8th century, Western religions such as Manicheanism, Christianity, Zoroastrianism and Islam arrived in China. It seems possible that the Jewish community of Kaifeng, now absorbed into the Han or Hui populations, dates from this period as well. While Western traders moved along the Silk Road and settled in Xi’an, there was also a notable colony of Arab traders in the south in Guangzhou. Though Muslims were noted as presences in the cities of China during the Tang and the subsequent Song dynasties, it seems likely that the permanent nature of the community was established during the Mongol Yuan dynasty, who promoted many Central Asian Muslims into positions of power in China proper and recruited Muslims to staff the bureaucracy and serve in the army. It seems likely that Muslim openness to professions which the Han traditionally disdained, such as the military and mercantile sector, played a role in their dispersion to various regions of China. Several prominent generals during the Ming dynasty were Muslim, as was the famous explorer Zheng He. While the presence of Muslims is clear from the textual and physical records during the Tang and Song dynasties, after the Yuan Mongol interlude Muslims are much more prominent. The aforementioned Jews of Kaifeng expended a great deal of effort at distinguishing themselves from the Hui, because the Han Chinese naturally observed the similarities of their religion to that of the Hui (the remnants of the Kaifeng Jewish community who were absorbed into the Hui often wear a black cap instead of a white one to prayer to signify their origins). Today the Hui are the generally the most numerous minority in areas where the Han are the majority. Though to outsiders they are not distinguishable from the Han physically and they speak Chinese dialects the People’s Republic classifies the Hui as a National Minority, and not as Han who happen to be of the Muslim religion. In other words a Hui who is an avowed atheist is still a Hui, a Han who converts to Islam becomes a Hui, while a Han who converts to Christianity remains a Han. Because of benefits conferred to National Minorities some assimilated groups of Han in China whose ancestors were likely Hui have attempted to reclaim the identity purely on ethnic grounds (as they do they not maintain any Islamic religious identity). The idea that Hui are always Hui is a modern fiction, insofar as genealogically it is almost certain that most Han have some Hui ancestry within the past 500 years. Because of the demands of Islamic orthopraxy, most notably the ban on the consumption of pork, there are obvious barriers between the Hui and the Han. But a population resident in China or centuries, speaking the Chinese language, trading with and living amongst the Han, is certainly going to be influenced by the dominant culture. In fact by the very physical appearance of the Hui it is clear that even if their forefathers were Arabs, Persians and Turks, Han women married into the community generation after generation, and so brought with them their own cultural presuppositions. Books like the Dao of Muhammad recount the influence which Chinese high culture had upon the Islamic intellectual class in China. Unlike in Africa or among the Turks, Muslims confronted in the Chinese a high culture of great antiquity which was confident in its own claims of access to ultimate truth. Unlike South and Southeast Asia Muslims did not come to China with military power or mercantile connections which gave them advantages over the native population. The Chinese had often considered the outside world superfluous, a trivial detail to be ignored in the ideal. As a small minority the Muslims had to engage with the majority on their terms, so they integrated Chinese metaphysical concepts into their theology and sketched out exactly how Islam complemented the traditions of China. These early modern scholars had Christian analogs, during the late Ming and early Ching period there was an attempt by Jesuits to convert elite Chinese to Roman Catholicism by reframing their religion as a complement to the secular principles elucidated within Confucianism. This accommodation was stillborn due to the infamous Rites Controversy which precipitated the banning of Christian missionaries in China in the early 18th century. But Islam does not have such a centralized institutional framework as Roman Catholicism, and the relative isolation of China from other centers of the Muslim world meant there was little outside sanction to innovation. It was in this manner that Islam could develop with Chinese characteristics. In Islam in China: Religion, Culture, and Politics, several essays explore the peculiar cultural terrain that the Hui traversed in their status as fundamentally Chinese and yet orthodox Muslims. Frictions between the Manchu ruling class of China, the Hui minority and the Han majority came to a head in the 19th century and resulted in several massive Muslim rebellions in the northwest and southwest. Though the Muslim specialization in martial professions served them in good stead, the reality of numbers took their toll and these uprisings were defeated. Concomitant with the religious conflict a series of reformist impulses were moving through the Muslim community, likely enabled in part by greater ease of communication with other Muslim communities. And yet despite this shift toward world-normative orthodoxy and the decline of the project to integrate Islam into a Chinese Confucian framework, Muslim movements often had to make recourse to Daoist inflected imagery and metaphor in their exhortations to rebellion. This can be understood in light of various religious secret societies, often Daoist and Buddhist, in fomenting uprisings against the political status quo throughout Chinese history, often in concert with peasant unrest. It stands to reason that as Chinese rebels the Hui would attempt to leverage apocalyptic rhetoric which their audience would be familiar with. But this fact goes a long way to suggesting how indigenized the Islamic identity of the Hui had become, during a phase of reform and shift toward world-normative Islamic belief and practice combined with greater consciousness of their distinctiveness due political mobilization, they still existed within a Chinese framework, and had to appeal to Chinese motifs as a means toward achieving the ends of the Muslim community. Again I believe the special and very distinctive history of Chinese Muslims by the 19th century must be reaffirmed. There is one school of thought which contends that Muslims have an obligation to emigrate if a non-Muslim power conquers the territory on which they live. This was the reason that a mass migration of Muslims from the former Ottoman lands north of the Black Sea occurred in the 18th century after the Russian conquests under Catherine the Great. Of course another school of thought is that Muslims may reside in non-Muslim lands so long as they can practice their religion freely, and those Muslims who remained after the Russian conquest appealed to this tradition and extended it. During the time of the Muslim rebellions in China India was ruled by the British East India Company, but the Mughal Emperor remained a figurehead, a nod to the fact that Muslims were by rights still the notional ruling caste on the Subcontinent. The fact that the secular Muhammad Ali Jinnah succeeded in creating a separate Muslim homeland out of British India is a testament to the numbers of South Asian Muslims, but also to the unpalatability of the inevitably dominant political position of non-Muslims in a united India to the Muslim upper classes. In much of Africa Muslims might have been the minority, but they were culturally and economically dominant. Even in areas where Muslims have been under the colonial rule of non-Muslims for generations, such as in Java, their religion received due deference. The Dutch even facilitated the final conversion of the Hindu kingdoms of East Java to Islam in their wars against Bali. In the 19th century the Muslims of China were sui generis. Their ancestors had emigrated to a land ruled by non-Muslims, never ruled by Muslims, and with little prospect that Muslims could ever come to power. Though during the initial centuries Muslims seem to have played a conventional role as merchants, after the Yuan, and into the Ming and Ching dynasties, Muslims served the Emperors of China as soldiers and diplomats. They were not simply strangers in the land, but they were of the land, and furthering the interests of the Chinese state in their lives. In such a way I believe the Chinese Muslims can serve as a model to Muslims around the world who are minorities, and who are making the transition from being in nations to being of nations. Intellectuals such as Tariq Ramadan are simply treading on the same ground Wang Daiyu and Liu Zhi did long ago, another instance of “it happened in China first.” Naturally the outcome will be different because Ramadan is a man of the West, and specifically the French intellectual world, which different tools and goals. But the principle is the same. Not only do Chinese Muslims serve as a model for how to exist within a plural society where Islam is not dominant, but it seems likely that within the next generation China will become the largest economy in the world and begin to reassert its conventional position as the preeminent power on this planet. Western Muslims are wont to assert that they have much to teach as members of the most dynamic contemporary societies, but it may be that in the 21st century Islam will start looking to the Far East. As Chinese geopolitical interests spread to the Middle East it would seem likely that just as Hui aided the expansion of the Manchu into Turkic Central Asia, so they would serve as intermediaries between Muslim nations and the Chinese government. Before the Asian Flu of the late 1990s Malaysian Prime Minister Mahathir Mohamed had given signals that perhaps the new developments in Islam would come from Southeast Asia. But while the economies of ASEAN are relatively quiescent China is a relative dynamo, and it will be interesting to see what changes are wrought among its Muslims, and these these Muslims might eventually shape the nature of the conversation in the Muslim world as a whole. About the Author: Razib Khan is an American blogger who blogs at Gene Expression. I think that we all Muslims carry the sin of not introducing Islam to China. Chinese people do not know a lot about Islam. Most of them do not believe or at least doubt about God. This may be sue to the education background they had at schools. We need to show them how much logical is Islam. They are almost isolated even in the current time. They do not have access to most of the websites people from the whole world have access to. This is a good and bad thing in the same time. This makes communication with them more and more difficult. We need to learn their language to be able to communicate with them perfectly. Examples for that , they do not have access to facebook, youtube and even wikipedia. Most of them do not use messengers famous in other countries like yahoo and MSN messengers. They use QQ. The most site visited in the whole world is Google and Yahoo , but they have other sites like 126.com and 136.com. I can not believe that Muslims leave Chinese without knowledge about Islam. China’s population is near 1/3 of the whole world’s population. However, how may websites talking about Islam has a Chinese version. If we want to introduce Islam to them , we must increase the number of published contents about Islam in Chinese. We need to go to the Chinese video sharinf websites and like http://www.youku.com and http://www.tudou.com and upload movies about Islam. We can send messages to them introducing Islam through their QQ. But we can not leave them without any knowledge about Islam. Allah will ask us about them. If Christianity is filling the post-Communist fundamentalist ideological void at such a rapid pace, why not Islam? Materialism, philosophical exploration & technological innovation have been dominated by the West for 500 years, yet still as Muslims such as the lawyer-poet Iqbal & others realised, it is a gloriously intricate but ultimately empty scabbard, & that civilisation will ultimately commit suicide in nihilist despair. Europe is the archetype, which the US will ultimately emulate on a grander scale. Muslims in the West have long realised that materialism is not enough, one needs the Divine source of sakinah. Materialism is effectively, in my view, a form of idol worship of Creation, paganism. Only the Rabb can give succour when all else fails, including self-worship. Thus, as a preamble, the Muslims well at ease in the materially relatively advanced West can potentially translate, being aware of the unique idiosyncrasies of idiom, their current works into a Chinese mould. The independent-minded Ummah & China could well be much needed allies to create a multi-polar world, while others quitely slip into mere satrapy-like imitation e.g. Indian society. that is why we will see cross the world educated people most of them they don’t believe nothing but If we see Muslim educated people believe in Islam much than Those who are not educated. Islam is the solution for Humenity we have to give the message to the people and save the people from hellfire. We have to Introduce people About The Holly Book Of Quran.which Miracle of Miracle. Leave a Reply to UK Muslim Click here to cancel reply.